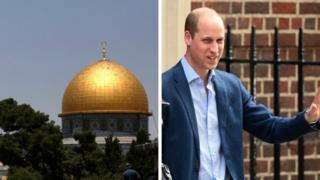 The Duke of Cambridge is to visit Israel, the Palestinian territories and Jordan in the summer.His five day trip will begin in Amman, the capital of Jordan, on Sunday 24 June and end in Jerusalem.He will also visit the Jordanian city of Jerash, Tel Aviv in Israel and the Palestinian city of Ramallah.It will be the first official tour of Israel or the Palestinian areas by a member of the Royal Family on behalf of the British government. He said the prince would be welcomed "with great affection".The Duke of Edinburgh and the Prince of Wales have previously visited Jerusalem, but not as part of an official tour. In 2016 the Prince of Wales also visited Tel Aviv for the funeral of former Israeli president Shimon Peres.Prince William's visit comes at a tense time for the region. In May the US inaugurated its first embassy in Jerusalem, despite Israel's sovereignty over Jerusalem not being recognised internationally.On the same day 60 Palestinians were killed by Israeli forces during border protests organised largely by Hamas - a militant Islamist group. » Jerusalem embassy: Are other countries planning to move?